Don’t despair on your diet this summer. Keeping a cool head and staying on track during a heatwave is a breeze, thanks to these must-know top tips! It’s hot, hot, hot outside and as the heatwave looks set to continue for a couple more weeks, the idea of dieting might seem altogether unappealing. We don’t get too much sun where we are so when it’s out, our advice is definitely to take advantage of it. However, if you’re dieting, how you enjoy the sunshine, might be different now. In the past, you may have opted for an ice-cold blip, but if you’re on TFR, that’s a no-no. There might be a heatwave, but our customers are more determined that ever. Why? Because they know that this will pass in just a few short weeks and at the end of it, they’ll look back and smile, proud of what they have achieved during that short time. Thankfully, you can stick to your diet, enjoy it and not feel like you’re missing out. As well as sharing our own advice, we asked our Secret Slimmers for their top tips for how to diet during a heatwave and we were super impressed with their answers. Big love to these guys for staying focused and determined on their end goal, even as the temperatures soar!! If you’re exercising while on plan, do it first thing in the morning or late at night when it’s cooler. Before you have a Shake, pop your glass into the freezer. That way, it’ll be super cool! Try our Water Flavourings, Peach Drainers and Pineapple Boosts. Staying well hydrated has never been more important. Top tip, you can freeze our Shakes & Water Flavourings. 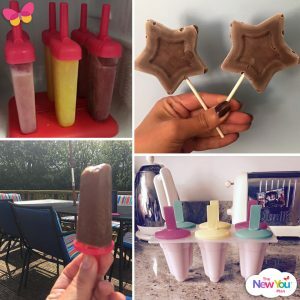 Pop into ice-lolly moulds and leave in the freezer to work its magic. Join Secret Slimmers. Everyone is in the same boat and you’ll pick up new tips every day! !